Habitat destruction has left many landscapes increasingly fragmented. These isolated populations, or metapopulations, are in a constant state of change-growing, shrinking, disappearing, and reappearing. 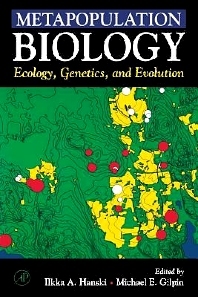 This unique volume brings together an international team of ecologists, geneticists, and evolutionary biologists who provide a comprehensive review of metapopulations. This book will provide fundamental reading for anyone studying the spatial dynamics of populations. This book is an essential reference for anyone who is interested in conservation and population dynamics. Conceptual Foundation: Introduction. Empirical Evidence for Metapopulation Dynamics. Metapopulation Dynamics and Landscape Ecology. Theory of Metapopulation Dynamics. Metapopulation Dynamics: Form Concepts and Observations to Predictive Models. Structures Metapopulation Models. Two-Species Metapopulation Models. From Metapopulation Dynamics to Community Structure: Some Consequences of Spatial Heterogeneity. Genetic Effective Size of a Metapopulation. The Evolution of Metapopulations. Metapopulation Processes: Extinction Models for Local Populations. Studying Transfer Processes in Metapopulations: Immigration, Migration, And Colonization. Migration Within Metapopulations: The Impact Upon Local Population Dynamics. Evolution of Migration Rate and Other Traits: The Metapopulation Effect. Spatial Processes in Host-Parasite Genetics. Case Studies: Butterfly Metapopulations. Tritrophic Metapopulation Dynamics: A Case Study of Ragworth, The Cinnabar Moth, And the Parasitoid Cotesia Popularis. Spatially Correlated Dynamics in a Pika Metapopulation. A Case Study of Genetic Structure in a Plant Metapopulation. Subject Index. Hanski obtained his first degree in zoology and botany in 1976 from the University of Helsinki, Finland, and his D.Phil. in zoology in 1979 from the University of Oxford. Since then he has been a postdoctoral researcher and faculty member at the University of Helsinki and is currently research professor in the Academy of Finland, where he directs the Metapopulation Research Group, one of the national Centers of Excellence in Research. In addition, he has served on the scientific advisory board of the National Center for Ecological Analysis and Synthesis (NCEAS) and has been on the steering group of the DIVERSITAS Programme on Biodiversity. He was foreign vice president of the Society for the Study of Evolution. He has served on the editorial boards of Trends in Ecology and Evolution, The American Naturalist, Journal of Insect Conservation, Global Change Biology, Annales Zooligici Fennici, Oecologia, Oikos, and Theoretical Population Biology. In 1999, he received the International Ecology Institute Prize in Terrestrial Ecology as well as the President's Gold Medal from the British Ecological Society. In 2000, Hanski was elected as a foreign member of the Royal Swedish Academy of Sciences. In 2001, he received the Sewall Wright Award from the American Society of Naturalists.